In a D'Arsonval galvanometer, a disk wound with many turns of fine wire can rotate in the field of a permanent magnet, its deflection proportional to the current through the wire. A coil spring (not shown) provides a restoring torque to the disk. 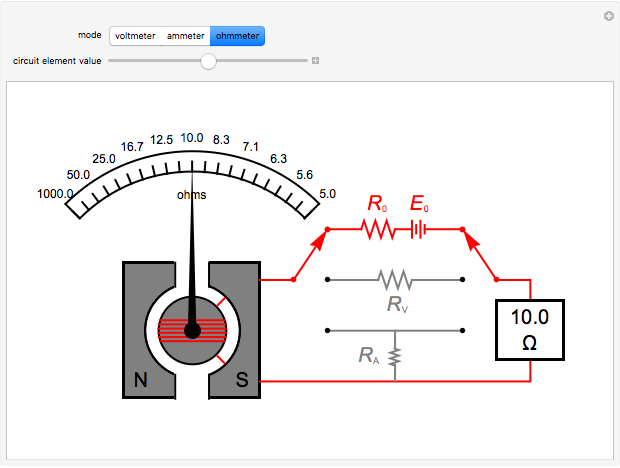 As part of an appropriate circuit, the galvanometer can function as a DC multimeter, measuring the voltage, current, or resistance of a connected circuit element, shown as a black rectangle. Depending on the mode selected—voltmeter, ammeter, or ohmmeter—the branch of the circuit shown in red is operative. As an illustration, let the resistance of the galvanometer equal 20 Ω, while and . This will enable the galvanometer to read voltages in the range -100 to 100 V and currents in the range -10 to 10 A. With an appropriate choice of and , resistances in the range 5 to 1000 Ω can likewise be measured. Note that the current through the galvanometer is inversely proportional to the resistance, thus the ohmmeter scale is linear in . The "circuit element value" slider controls the value of voltage, current or resistance, as shown in the box in the graphic. (Its numerical value corresponds to the angular displacement of the needle in radians.) The ranges of the three scales are adjusted by additional circuit elements, not shown in the diagram. The rudimentary setup shown in this Demonstration is intended to show the general principles involved in the functioning of a multimeter. Modern instruments are based on solid-state components and can be adjusted for several different ranges of voltage, current and resistance. They can also handle AC, as well as DC, circuits. S. M. Blinder "Galvanometer as a DC Multimeter"